Drawing may be innate in humans. Scientists have estimated artifacts showing evidence of workmanship with an artistic purpose happened 40,000 years ago. Whether for satisfaction, the preservation of an historic event, or trying to extend communications beyond our mortality, visuals are a part of who we are. This blog will focus on the what, when and how to best incorporate the use of the instructional strategy mapping. Mapping is a “spatial” learning strategy that graphically displays information and the relationships between or among information. It is a visual tool for constructing knowledge. Mapping is the teaching strategy that most closely mimics how the brain works. It is pretty much accepted as fact that our memory does not store individual facts in isolation but via relationships. A great example is the Visual Thesaurus. A detailed paper regarding mapping covering the theory and some more details on how to construct maps see the article by Novak & Canas. A related capacity of us humans is to categorize and classify our experiences and mapping is no different. In the set of all images, Marzano, et al (2) refer to maps as “nonlinguistic representations” and categories of “graphic organizers”. 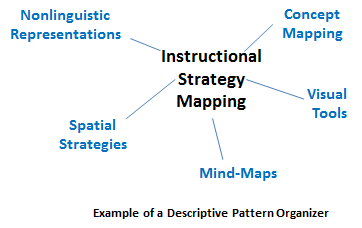 In the book, Instructional Design, Implications for Cognitive Science, West, et al, (3) starts with families of learning strategies and mapping is in the classification of “spatial ” along with frames type one and two (think tables). Hyerly (4), in the family of “visual tools” uses the term “thinking maps” and provides application for “webs, organizers, and thinking-process maps. Ok. So besides sharing these resources with you, the points I want to make at this time are: DO NOT to get hung up on the terminology and there is help available for just about any kind of map you can think of and some you probably wouldn’t. A map consists of a principal topic, at least one associated piece of information and some relationship between the topic and the associated information. From there, there really is no limit. Elements can be represented by just words, or by using a variety of words in symbols such as circles or rectangles. Relationships are usually represented by various types of lines. The relationships can be defined or inferred. I suggest developing a legend for more complex maps. Take a moment and identify the relationship in the Descriptive Pattern Organizer example above. What word(s) would you use on the lines between the main topic (instructional maps) and the elements to describe the relationship? My interpretation can be found in the right column. Event of Instruction: Inform learners of objectives: What a great way of explaining the relationship of the course content and the relationship as to how the learning will apply on the job. A map can be used as a type of advanced organizer describing the path of mastering the performance objectives. Event of Instruction: Recall of prior knowledge: Lubricate your students minds by having them associate what they already know related to your topic. Considering the plethora of relationships it’s a good bet your students will surprise you. After all, one of the characteristics of adult learners is the knowledge and experience they bring with them. Event of Instruction: Present the content: Provide a map related to your specific subject and refer to it and the relationships as you cover the topic. Another application would be to provide the students with a partially completed map and have the learners complete the map while you unfold the course content. Event of Instruction: Provide learning guidance: Mapping can be used as an elaboration strategy. Have the students construct a map. The power of elaboration can be enhanced by asking students to explain and justify their elaborations. Cooperative learning: create groups and have the group develop a map. A map could be used to aid the learner in choosing a learning strategy (metacognition). Event of Instruction: Assess performance: Maps can be used in a variety of ways to verify the attainment of declarative knowledge. Use a map as a form of fill in the blank and have the learners supplement the relationships or have them provide salient elements to a concept or process. Event of Instruction: Enhance retention and transfer to the job: Utilize a “graphic facilitator” to construct a real-time map as the learning progresses. Review the map and reconnect to the learning objectives. Open the review up to questions and clarifications as course material is reviewed. There are software programs specifically designed to develop maps; Mindjet, seems to be a popular one. An internet search will yield several possibilities. Hybridized example: I designed the following map example for use as a review activity following a video from within a computer-based course. To complete the map, roll your mouse over the possible topic answers. Click on an answer. The correct answer completes that part of the map and launches the next element. An incorrect answer provides feedback. The various sections of the map are completed in succession. I hope to have inspired you to take another look at the mapping strategy; not only for your design considerations, but as a tool for you as well. 1. Mayer Richard, E. (2003). Multimedia Learning. New York, NY: Cambridge Press. 2. Marzano Robert, J. Pickering Debra, J. & Pollock Jane, E. (2001). Classroom Instruction that Works: Research based strategies for increasing student achievement. Alexandria, Virginia. Association for Supervision and Curriculum Development. 3. West, C. K, Farmer, J. A. & Wolff, P.M. Instructional design implications from cognitive science. Englewood Cliffs, NJ: Prentice‑Hall. 4. Hyerly David. (1996) Visual tools for construction knowledge. Association for Supervision and Curriculum Development (ASCD). Alexandria, Virginia.